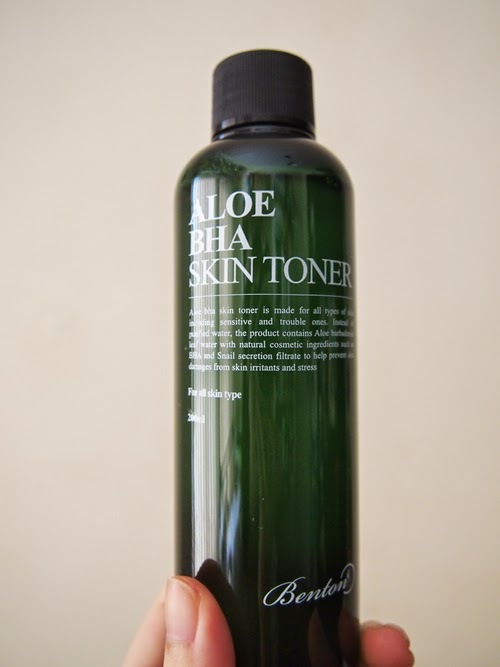 Description: (From the bottle) Aloe BHA skin toner is made for all types of skin including sensitive and trouble ones. 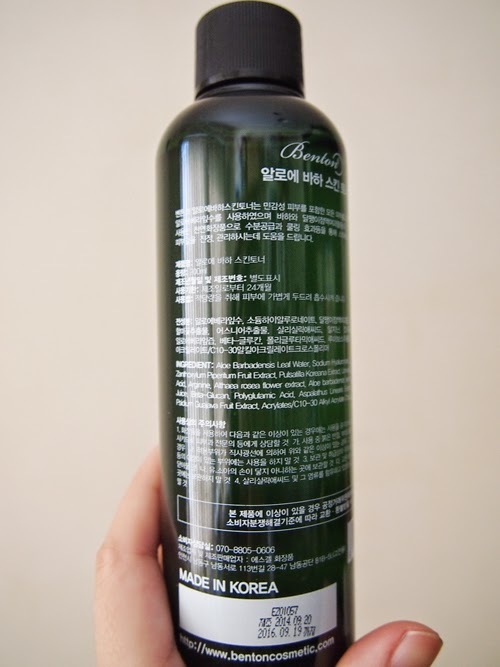 Instead of purified water, the product contains Aloe barbadensis leaf water with natural cosmetic ingredients such as BHA and Snail secretion. 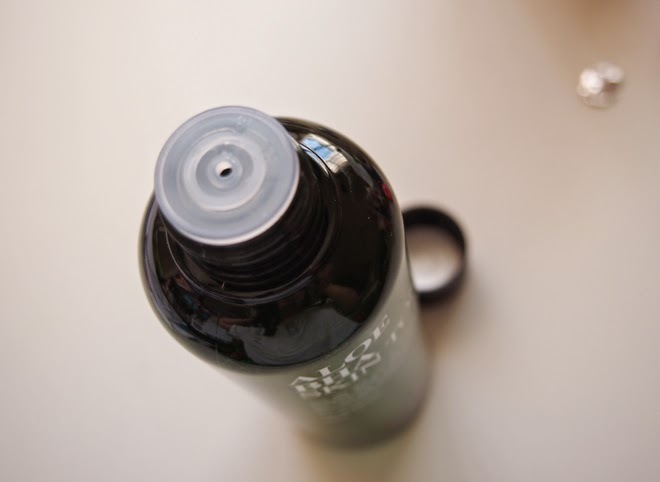 Contents: 200ml packaged in a sturdy see through green plastic bottle. There is a little hole you pour the toner through at the top. The old packaging features the spray nozzle. Application: My preferred method is to pour the toner on a cotton pad and lightly wipe in the direction of my skin (outwards). 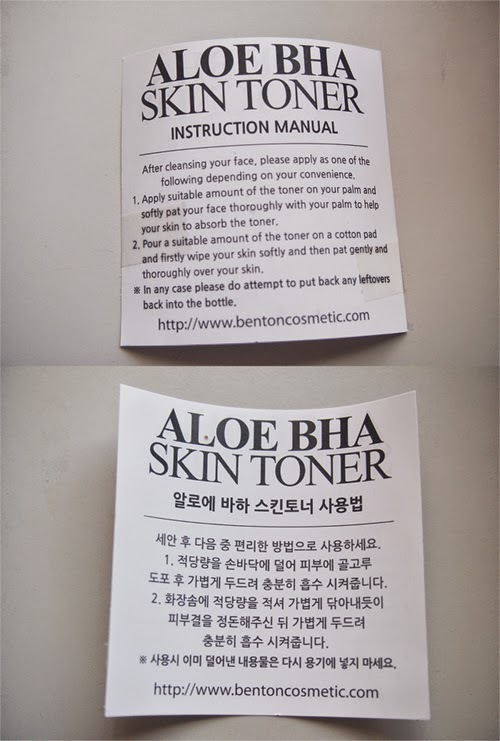 If you prefer, you can also apply with you hands by patting the toner into your face. FYI first four ingredients are Aloe Barbadensis Leaf Water, Sodium Hyaluronate, Snail Secretion Filtrate, and Glycerin. The BHA used in this toner is Salicylic Acid, and it appears eighth on the list (out of 17 ingredients). This is a hydrating toner that is clear and a little bit viscous. No fragrance has been added, but there is a smell which I can't describe. It's not unpleasant, but you can smell it. It did not sting my face, and it made my skin feel like I've just applied lots of nourishing goodness to it. Over the three weeks (and on going!) I've used the toner, I've noticed the sebecus filaments on my nose have reduced. Because of my dry skin, I needed to layer the toner with other products, such as a serum and other moisturisers or gels to lock in moisture. I can imagine that the toner can be easily be incorporated into a skincare routine with oily, normal, and combination skin as the toner is mild and gentle. I am hesitant to say that I have seen amazing results and I would think that I will need to continue using the toner for a longer period of time before I can confirm it, but my skin texture has also felt a bit smoother. 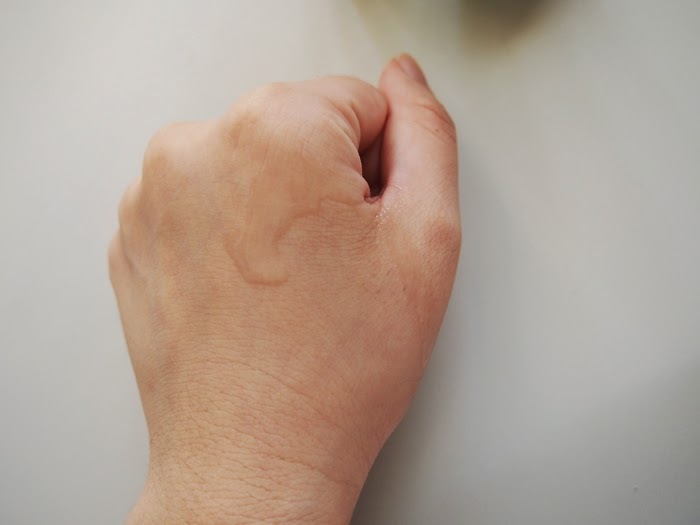 I patch tested the toner on my wrist for a few days before deciding to use it on my forehead in case I was allergic. My skin was fine. I then started to use it on my cheeks, chin, and nose as well. I used the toner once a day at night. It is very refreshing and light-- I did not get a sticky feeling from it. I should note that even though the toner contains BHA, Kerry from Skin and Tonics has stated that the concentration of BHA in the toner (0.5%) as well as the pH of the product (5.5-6) is not strong enough nor at the right pH level to have proper exfoliating properties. Therefore, you will not have to wait the usual 15 to 20 minutes as you normally would for the effects of an acid to take place before layering other products. I will continue to use this product until it's finished. It's a good all purpose, gentle, hydrating toner, and a good introduction to snail mucus products. As stated above, Benton is a brand that is known for having no fillers or preservatives in their products. Therefore, you may want to be careful about where you store the product (e.g., away from heat, away from light) in order to make sure the product is still fresh and doesn't change. Even though it is currently Spring in Australia, temperatures have risen to as high as 35 to 40 degrees celsius. In response, I have been diligent about storing the toner away in my wardrobe away from heat and sunlight to ensure the product doesn't break down. 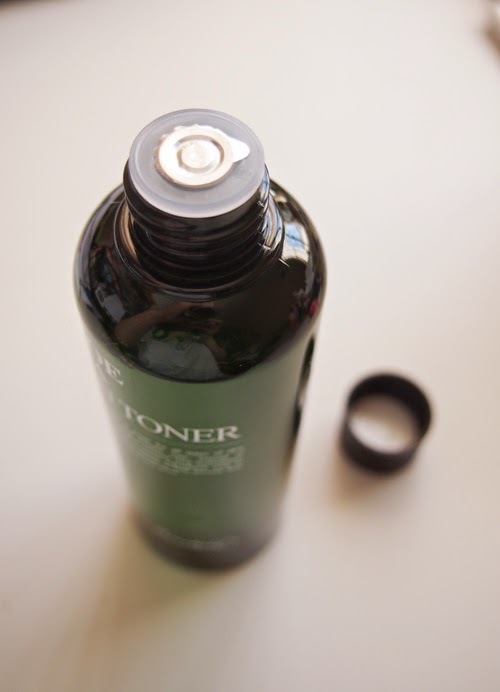 If you're interested, you can pick up the Benton toner from Jolse here for $15.28 (with free worldwide shipping and free gifts/ samples:). There is currently a 10% off storewide sale and a 5% return on mileage until December 25th, 2014.